The nomination form can be found at Muscatine High School – Principal’s Office or on the Muscatine High School web site at www.muscatine.k12.ia.us/mhs. Under “Forms” click on “Hall of Honor Nomination.” A nominee must be an individual who has achieved distinction in profession, public and/or community services and has had a positive influence on the lives of others. They must be a graduate of Muscatine High School at least 10 years prior to the year of nomination.If you have any questions, please contact Doreen Borde at doreen.borde@mcsdonline.org or call Muscatine High School at 263-6141 x 1116. MHS Student Parking Permit Tags – If your student purchased an MHS Parking Permit, you can pick those up in Student Services – Mrs. Meeker beginning August 15. Please bring your receipt with you. If you did not purchase a Parking Permit, you can do so at any time at the Attendance Office. The fee is $25 and you will need to fill out a Parking Permit form which requires a parent signature. Laptop pickup this week: Aug. 10 & 11 from 8:30 – 11 AM and 1 – 3:00 PM in the Library. East Campus Registration Reminder – Reminder to all parents that are registering their students for the East Campus program. East Campus is a part of Muscatine high school and all students registering for East Campus in the fall will need to register as a Muscatine high school student. Back-to-School Night – August 17th, 5-7 PM – Take time to walk your class schedule (available on PowerSchool), visit with staff and friends you haven’t seen throughout the summer, and meet the new MHS Principal, Jared Smith, and new Asst. Principal, Mark Grotelueschen. Fall Sports Kick-off – August 18th, 5-9 PM – MHS student-athletes, marching band members, pom pon, and cheer members will be recognized during the night. Don’t miss the Muskies Boosters Cookout starting at 5 PM (pork chop sandwiches, hotdogs, and hamburgers, chips and drink on sale). Football scrimmage will begin around 7 PM. 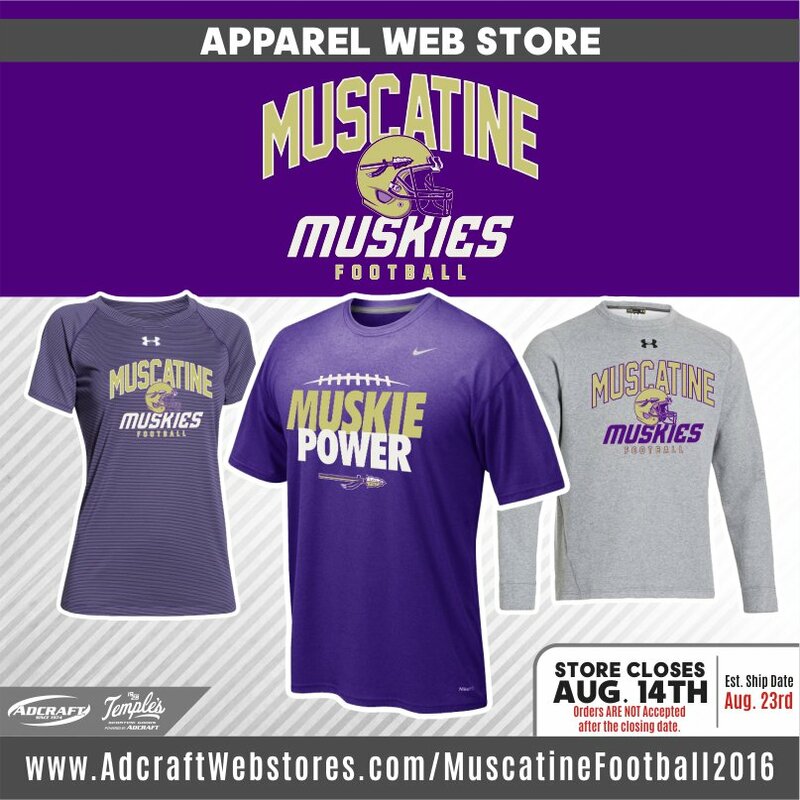 Purchase your Muskie spirit wear as well. Hope to see you there – Admission is free!